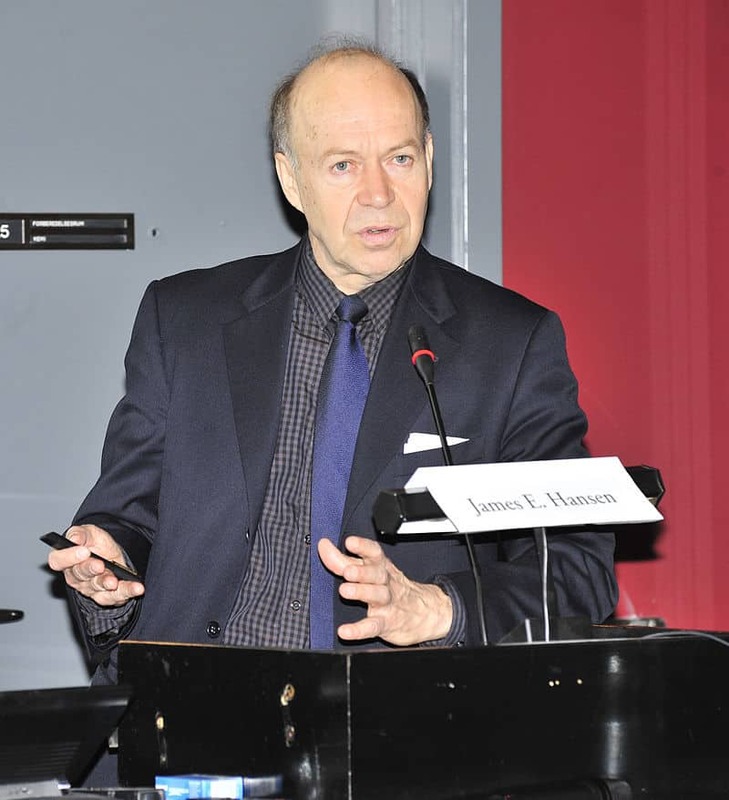 The repercussions of climate disruption are still not being acknowledged fully, warned climatologist Dr. James Hansen, addressing an audience of Baby Boomer and Greatest Generation climate activists on September 9. “We’ve now got an emergency,” he told about 150 “elder activists” at Calvary Baptist Church in Washington, DC, who were participating in Grandparents Climate Action Day. Hansen–formerly NASA’s head climate scientist, now Adjunct Professor at Columbia University–is probably best known for bringing definitive evidence of global warming to Congress in testimony in 1988. In July of this year, he released a report with sixteen co-authors studying glacier melt in Greenland and Antarctica. Unlike previous models, the new report takes into account some feedback loops which may be hastening the loss of ice sheet mass far faster than anticipated. Mass species extinction, extreme weather events, dry spells and fires are climate change impacts which are happening now. A warmer atmosphere and warmer oceans can lead to stronger storms, he explained. Superstorm Sandy, for example, remained a hurricane all the way up the Eastern seaboard to New York because Atlantic waters were abnormally warm. “Amplifying impacts” and feedback loops will accelerate the changes, according to Hansen. “It will happen faster than you think,” he said. If major coastal cities become “dysfunctional” because of sea level rise, as he believes is possible, the global economy could be in peril of collapse. It is therefore imperative to stop using coal, oil and gas as energy sources now. “We’ve already burned as much as we can afford,” he said. Fossil fuels already burned will continue to have impacts, because the climate system “has inertia.” “We’ve only felt the warming for half of the gases that are up there,” he said. The use of fossil fuels is still on the rise in spite of the dangers, he said, because governments subsidize them and don’t make companies bear the real costs to society. The only viable way to make the price of fossil fuels “honest,” in his opinion, is to implement a “fee and dividend” system. Hansen, a grandparent himself, was the keynote speaker at Grandparents Climate Action Day, an event to mobilize elder activists and promote a policy agenda aimed at reducing greenhouse gas emissions. Hansen believes elders possess resources and wisdom which, combined with the zeal of youth, can help find solutions to climate change. “Older people have a lot of clout, a lot of votes, and time,” he said. With more older people getting involved, there will be more pressure to make needed changes. Fellow speaker John Sorensen, co-founder of the Conscious Elders Network, echoed this point. The 80 million elders in the U.S.–25% of the population–are living longer and healthier lives with more time and resources to devote to activism. Hansen is supporting a lawsuit in which 21 young people are suing the U.S. government. (One of the plaintiffs is his granddaughter Sophie.) The lawsuit alleges that the federal government knew decades ago that burning fossil fuels and climate were linked, but continued on the same course anyway. “Young people have all these rights that are guaranteed by the constitution, and that’s what we’re asking the courts to look at, and I think this may be our best chance to force the government to do its job,” he said.